A national park erected in memory of Osagyefo (the Messiah) Doctor Kwame Nkrumah, Ghana’s first president and one of its founding fathers. Built on a former British polo field, it was the point where Nkrumah declared independence in 1957. 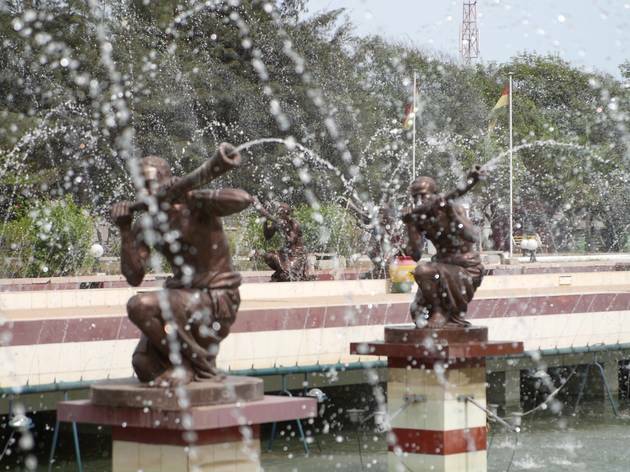 The park consists of five acres of land and holds a museum tracing Nkrumah’s life. There are many personal items on display, but the centrepiece is the mausoleum, Nkrumah and his wife’s final resting place. Tours in English can be taken. Kwame Nkrumah is an essential part of Ghana’s history and a good half-hour here will fill you in on most of the details. Events are held on Independence Anniversary celebrations on 6 March and the Celebration of Emancipation Day on 1 August. Admission Ghanaian adult GH¢0.50; non- Ghanaian adult GH¢1.50; extra charge for cameras. This is one of the most beautiful memorials and museums I have ever been to. The orginal car driven by the former president is there, a beautiful gold statue, with a beautiful black star can be seen. It hangs over the beautiful water fountain. 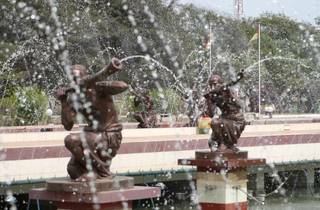 The statues are frozen in motion, playing African drums and blowing horns. There are beautiful peacocks walking around. There is a lovely bookshop and you can just sit in the shade of the trees, whilst the water flows. The contribution made by the First president of Ghana to the country, is considerable and can be seen, within, around and outside the museum. It was an unspeakable honour to visit there.